“Not a word,” Lin Pingzhi answered quickly. “When they spoke or did things, did you notice anything unusual?” Lin Zhennan inquired further. “Did you say the man’s name was Yu?” Lin Zhennan interrupted. “It can’t be! It can’t be a coincidence. 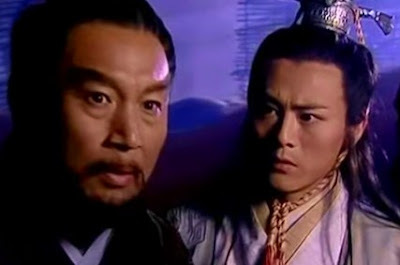 Master Yu said he was going to send someone over; how could they have arrived at Fuzhou so quickly? They don’t have wings,” Lin Zhennan shook his head and muttered to himself. “Father, you don’t think those two were from the Qingcheng Sword School, do you?” Lin Pingzhi’s voice quivered. “He couldn’t fend off that move, so I slapped him hard on the face,” Lin Pingzhi replied. “Good! Very good! Excellent!” Lin Zhennan smiled. The room had been filled with foreboding, but now that Lin Zhennan showed a smile, Lin Pingzhi felt quite relieved and could not help smiling himself. “When you hit him with this move, how did he respond?” Lin Zhennan asked again, performing more different moves as he spoke. “I was infuriated at the time, and can’t remember too well. I think I punched him in the chest,” Lin Pingzhi replied. He kept saying “very good,” but he wasn’t complementing his son’s fighting skills; he was just relieved. There must be many people named Yu in the province of Sichuan; if this particular Yu could not even beat his son, he must have been a terrible fighter. Such a rotten fighter definitely had nothing to do with the Qingcheng Sword School. He kept tapping on the table with his right middle finger as he pondered upon the situation. “How did he grab hold of your head?” he asked, and Lin Pingzhi demonstrated how he couldn’t move when his head was held. “It was something like this.” Chen grabbed the back of a chair and threw a reverse kick with his right foot, then jumped and threw another back kick with his left foot. These two kicks looked very clumsy, almost like a horse kicking back its hind legs. Lin Pingzhi watched the two clumsy kicks and could not help laughing. “Dad, see….” But then seeing the fearful expression on his father’s face, he stopped abruptly. “These two kicks seem to be the unique “Shadowless Kick” maneuver of Qingcheng. Son, how did he perform the kicks exactly?” Lin Zhennan inquired. “My head was held at that moment. I couldn’t see how he kicked,” Lin Pingzhi said.